Most sponges, inspiration for dish cleaners and mess absorbers, feed by filtering water through those many holes and channels. Their scientific name, Porifera, literally means pore bearer. The channels are lined with special cells, chanocytes, each containing a flagellum that continuously beats. This whirling action by the flagellum filters nutrients and small particles of food from the surrounding water. With the particles near, the cell quickly engulfs by wrapping part of its membrane around it like a puppy lost in blanket. However, in this metaphor the puppy is digested by a dog-sized cell. Flagellum and ingesting puppies, metaphorically speaking, is the norm for most sponges. However, in the dark depths of oceans and in the black caverns of the marine caves, lurks Earth’s strangest creatures—the carnivorous sponges. Most sponges are composed of spicules, little shards of silica, that provide structure. In the carnivorous sponges, Cladorhizidae, some spicules are shaped like hooks. Unsuspecting tiny crustaceans or other animals near the sponge are often caught in the sheets of hooks that line the surface of the Cladorhizid sponges, much schmutz in Velcro. In some Cladorhizids copepods may be caught by an adhesive surface. Once a crustacean is caught, the cells surrounding mobilize, cover, and create a temporary cavity around the crustacean. Within this cavity the crustacean is digested. It’s the equivalent of mosquito being caught in your arm hairs , the skins cells then form a layer of skin over it, and finally you digest the mosquito just below the surface of the skin. The first species of Cladorhizid was described only recently in 1995 from submarine caves in the Mediterranean. In approximately the last 20 years, 33 species have been discovered and described, with several more in the works. Even though new to humans, Cladorhizids have dwelled on Earth since at least the Pleistocene, 2 million years ago. Fossils from this period are easily identifiable as the bizarre sponges. However, 200 million year old spicules do bear a striking resemblance to those from the carnivorous sponges of the modern oceans. Even more unusual is the bewildering shapes that Cladorhizids take, from the pipe cleaner structure of Abestopluma, to the ping pong tree structure of Chondrocladia lampadiglobus, to the beautiful harp shape of Chondrocladia lyra. The evolutionary reasons for this vast variety of shapes among species remains a major unknown, as is most of the biology of the fascinating group. 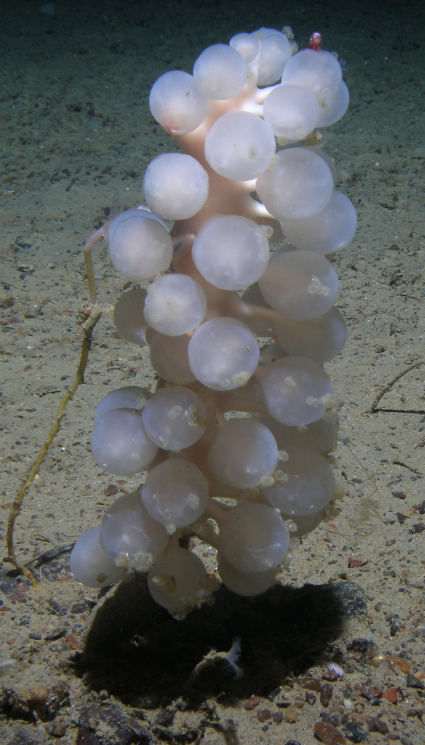 Despite our lack of knowledge a carnivorous sponge is deserving of rightful place as a top 10 species. Les Watling (2007). Predation on copepods by an Alaskan cladorhizid sponge. Journal of the Marine Biological Association of the United Kingdom, pp 1721-1726. doi:10.1017/S0025315407058560. Chondrocladia gigantea, the giant club sponge, and a cerianthid anemone. You can see another great photo here. Chondrocladia turbiformis, collected on a Macquarie Ridge seamount between 1000-1100 m depth. Share the post "Flesh Eating Sponges?" Love the photos. Especially the one of Chondrocladia gigantea. It is even more amazing because according to the source (SERPENT Media Archive) it was taken at the site “Atlantic, Norwegian, Midnattsol”. Midnattsol is the Norwegian/Swedish word for midnight sun. So the photo was taken at…ehh…the sun? A small correction. The specimen labelled as Chondrocladia turbiformis is actually a Cladorhiza, very close to Cladorhiza corona, described by Helmut Lehnert, Bob Stone, and myself from the Aleutians. We think of it as a daisy, similar to those flesh eating flowers from a long ago Star Trek episode…. Next Next post: Fossil Carnivorous Sponge?